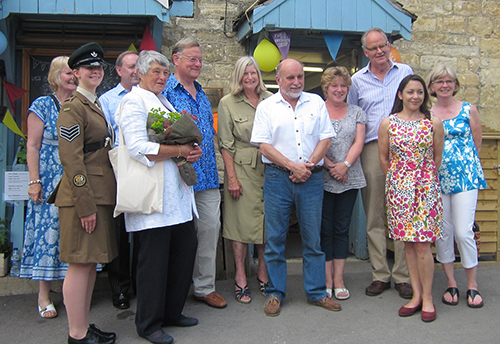 Wednesday 1 July 2015 – Dame Janet Trotter, Lord-Lieutenant of Gloucestershire, joined volunteers at Uley Community Stores today to celebrate three years of successful trading as a community-led store. The Queen’s representative in Gloucestershire was presented with gifts of local produce and flowers from volunteers, and met representatives of Uley’s community groups such as Len Freeth of Uley Society, Sally Lamerton of Uley WI and Hannah Saunders, acting head of Uley Primary School and four pupils from the school council. “We’re particularly honoured to have Dame Janet as our distinguished guest. An occasion like this pays tribute to all our fabulous volunteers, committee and shareholder members, – in excess of 400 people – who cherish their local shop,” said Peter Randall, Chairman of the UCS Management Committee. After a tour of the store and Post Office, Dame Janet and other guests joined more volunteers and residents at the village hall for Pimms, strawberries, tea and cakes catered by Uley WI. Uley residents saved their local shop and Post Office in 2012 by purchasing community shares, raising more than £50,000 for refurbishment and new stock. The shop’s turnover continues to increase – this year by 15 per cent on 2013-14. UCS’ anniversary coincides with Community Co-operatives Fortnight, hosted by the Plunkett Foundation, which celebrates the achievements of community-run enterprises such as shops and pubs. “We were keen to acknowledge the hard work and commitment of all our volunteers at this special time by throwing a party to say a really big thank you,” said Peter.